Gibson Dunn | Campbell, Gregory A. 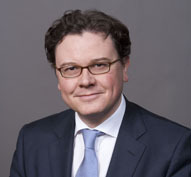 ​Greg Campbell is an English, Irish and New York qualified partner in the London office of Gibson, Dunn & Crutcher. Mr. Campbell’s practice focuses on advising borrowers, sponsors, lenders, creditors and investors in cross-border financings, restructurings and special-situations transactions. Mr. Campbell previously served as judicial assistant to the Rt. Hon. Lord Justice Kennedy (Vice President of the Queen’s Bench Division) and the Rt. Hon. Lord Justice Mummery in the English Court of Appeal. Mr. Campbell took a degree in Jurisprudence with first class honours from Merton College, Oxford, and an LL.M from University College, London, majoring in international and comparative insolvency law. Mr. Campbell has contributed to various articles and publications on the subjects of corporate insolvency, finance and security. He is a member of the firm’s Pro Bono Committee. Mr. Campbell has been ranked as a leading practitioner by Chambers UK in the Restructuring/Insolvency category, which has noted that he “is rated by his clients as a ‘technical genius’ whose approach to instructions is ‘extremely responsive, and very sensitive to timing”. Previous editions have noted that “Gregory Campbell is very savvy and understands his client’s objectives… ‘he answers not only the question you asked but the question you should have asked'”. Chambers UK has also ranked Mr. Campbell in the Banking & Finance category, with sources commenting that he “excels in negotiations”. Mr. Campbell has also been recognized by The International Financial Law Review (IFLR) as a leading lawyer in the bank lending category which noted that: “Gibson Dunn & Crutcher’s finance team is praised by clients for its strong knowledge. Greg Campbell comes in for specific praise from a corporate client: ‘He really is outstanding – very, very strong, and a great negotiator. He fights for every point and does a lot of winning'”. He is also recognised for Bank Lending: Investment Grade Debt and Syndicated Loans in The Legal 500 UK 2015. Article - July 3, 2018 | A World of Convergence? Article - April 16, 2018 | Intra-group Asset Transfers: In the Net, or Out?